Apps in the App Store are available to all Brightpearl accounts. To make an app available on the App Store it must be built by a registered Brightpearl developer. It is the responsibility of the developer of the app to manage and support customers using the app. The first stage of creating a new public app is to add the details of your app within your Brightpearl developer account. You will then have all the authorization tokens you need to begin connecting to Brightpearl from your app. Your app will pass through three stages of review with Brightpearl before it is approved and added to the App Store for customers to begin using. You can, however, allow selected customers to begin using your app once it is beta so that they can trial it for you before final release. Complete the form with the details of your app. Select the payment type. This will add the relevant detail to the app in the app store so that customers know how to purchase your app. Upload the app logo - this will be displayed in the App Store. Enter your URLs. These become the links on your app in the App Store and enable customers to get the help they need. 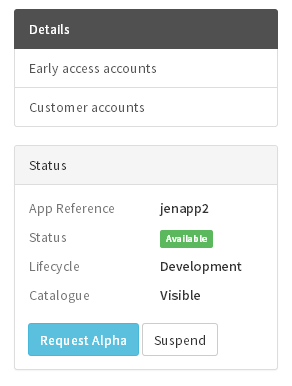 Once the app is saved you will see the menu and status box on the right-hand side where you are able to specify which Brightpearl accounts can use the app whilst in development.